Casey initially came to UNE after successfully gaining Early Entry into the Bachelor of Agriculture in 2011. 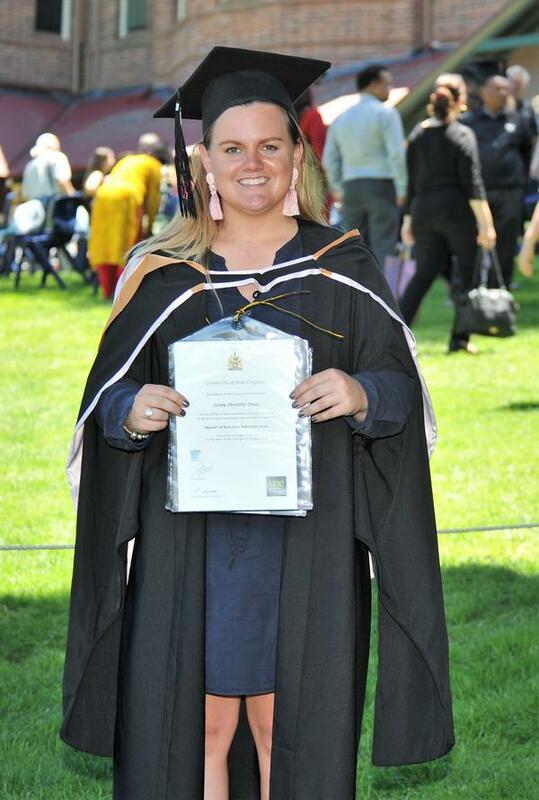 After completing this degree and entering the workforce, Casey then decided to undertake a Master of Business Administration to compliment her existing skill set and gain a greater understanding of the business needs of agricultural operators and larger corporate companies. Casey has been able to experience the flexibility of study at UNE, having studied on campus and online, both full-time and part-time at different points in her study. As an online postgraduate student, Casey was able to also work full time as an Agronomist. Casey also had the opportunity to participate in the New England Award, which allowed her to be recognised for participation in extracurricular activities she was involved in. “This encouraged me to apply myself to a greater extent and grasp every opportunity that was available, which included heading to Miami for the IFAMA World Conference and Study Tour across several states in the US,” says Casey. For Casey, graduation means the light at the end of the tunnel that rewards students for the hard work they put in to complete their degrees.